The Broadway Theatre is one of only five playhouses that front on the street named Broadway. It opened in 1924 as B. S. Moss's Colony, a premiere film house. The most notable film that played there in the early years was Walt Disney's Steamboat Willie which opened in 1928, and introduced American audiences to an adorable rodent named Mickey Mouse. 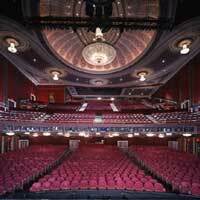 The theatre went "legit" from 1930 to 1934, when it was re-christened the Broadway. From 1934 to 1940, the house was once again dedicated to motion picture exhibition, and offered the premiere of Disney's Fantasia in 1939. In 1940, however, it returned to legitimate stage production and, except for a brief stint as a Cinerama movie theatre in the 1950s, has remained in the business of showcasing live theatre ever since.